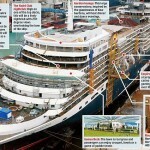 the old Queen Elizabeth ship location, news. “RMS Queen Elizabeth 2” is the name of the old Cunard liner (operational between 1969-2008, when she was acquired by Istithmar World investments). There is a very expensive warship construction project by the UK’s Royal Navy to introduce into service in 2016 a brand new HMS Queen Elizabeth aircraft carrier – namesake to the famous Royal Navy battleship (operational between 1913-1948). 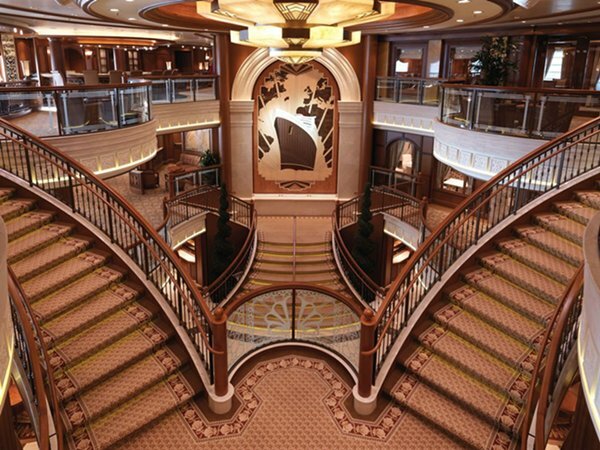 The Cunard Queen Elizabeth cruise ship debuted in 2010 with its impressively grand interior spaces, top technology and innovations and the long list of huge Cunard-brand expectations all over the world. Along with the Cunard Queen Victoria ship, ms Queen Elizabeth is smaller and quieter version of the grand lady RMS Queen Mary 2 (QM2). Queen Elizabeth cruise ship has classy interior layout, taking the best public rooms, lounges and bars aboard QM2 and the retired QE2, and setting them into this high-tech ship specially designed for both trans-Pacific and trans-Atlantic crossings, as well as Panama Canal transits with a mix of short and long cruises. 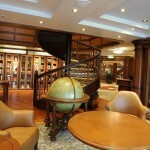 For more info – this link goes to the QE ship’s page at the Cunard Line website. Cunard Queen Elizabeth cruise ship joined her sister ships Queen Victoria and Queen Mary 2 in September 2010. She was delivered by Fincantieri, second largest ever built ship for Cunard and sails from Southampton, UK. 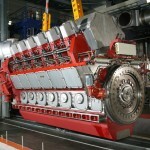 QE was ordered in October 2007 and in June 2009 her keel was laid in Italy at Marghera Shipyard. After Queen Elizabeth launching in January 2010, the first sea trials of the ship were carried through in August and September 2010. 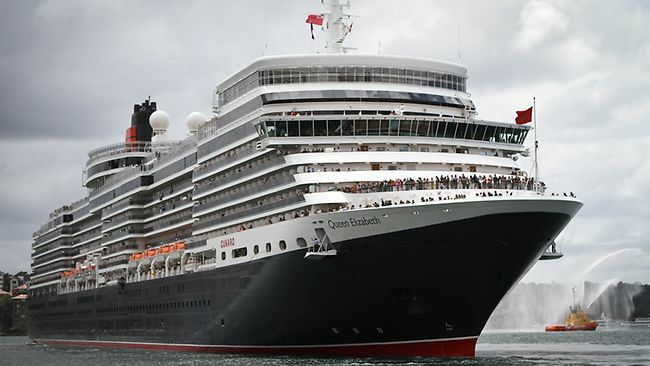 The Queen Elizabeth ship dimensions are 90,900 gross tonnage, overall length is 294 m (965 ft), beam/width is 32.3 m (106 ft), and draught/draft is 8 m (26 ft). QE keel-to-funnel height is 64.6 m (212 ft), while height above waterline is 56.6 m (186 ft). 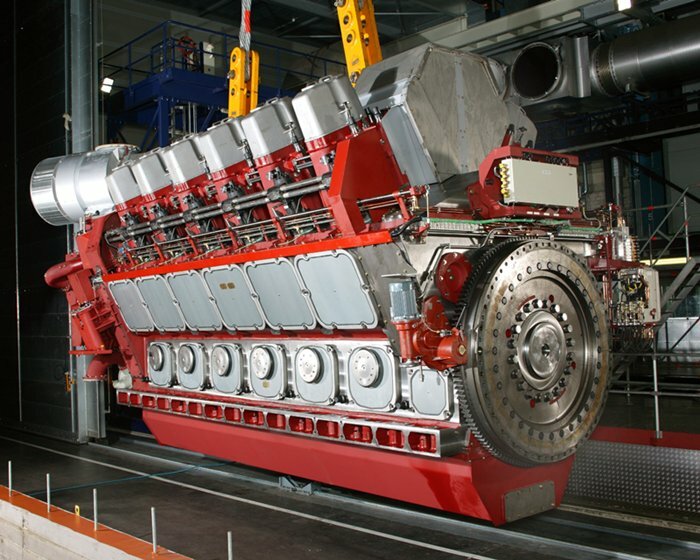 The power for propulsion and systems of ms Queen Elizabeth is provided by 6 MAK marine diesel engines – four of them are MAK 12M43C (low emission, long-stroke V12, 6 cylinder, power output 11,4 MW – see photo at the right) and two are MAK 8M43C (4 stroke, inline 8 cylinder, power output 7,2 MW), all six running on heavy fuel, producing a combined power of 64 MW. 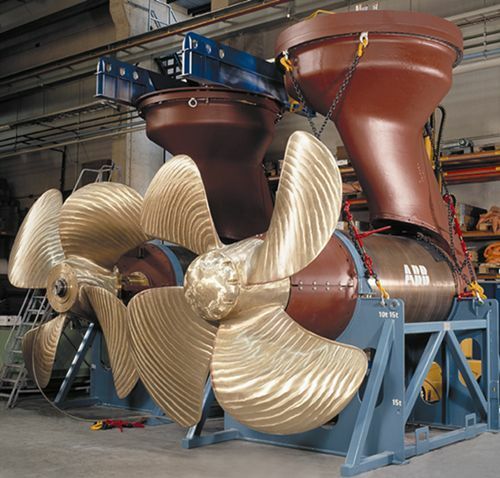 The Queen Elizabeth cruise ship propulsion system is of the diesel-electric type, and also features 2 Azipods ABB (azimuth thrusters, power 17.6 MW each – the photo at the left) and also has 3 thrusters Fincantieri Riva Trigoso (power 2.200 kW each). 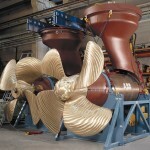 She also has a pair of stabilizers Fincantieri Riva Trigoso (active fins mounted in the hull, beneath waterline). The QE’s normal cruising speed is 23.7 kn (knots), which is in mph 27.3, and in kph is 44. On her Maiden Voyage, MS Queen Elizabeth cruised on a 13-night Atlantic Isles voyage from Southampton. The three Cunard sister ships Queen Victoria, Queen Elizabeth and Queen Mary 2, met in January 2011, and sailed out of New York Harbour. You can watch here the YouTube video about the Cunard Queen Elizabeth christening ceremony. On the 11th of October 2010, HM Queen Elizabeth II smashed the bottle and named the new ship in Southampton with the words “I name the ship Queen Elizabeth. May God bless her, and all who sailing her”. addition of 9 new single occupancy cabins (of which 8 Oceanview and 1 Standard). 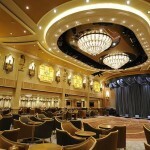 The Casino was remodeled to make space for the new rooms. 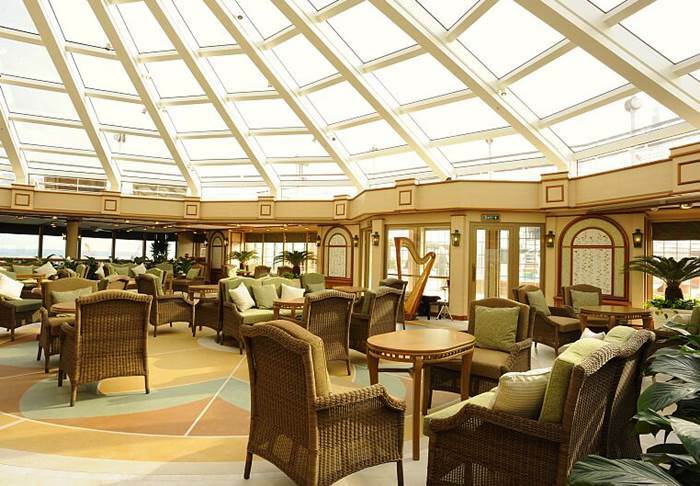 The total cost of the Cunard QE 2014 refurbishment project was $30 million. 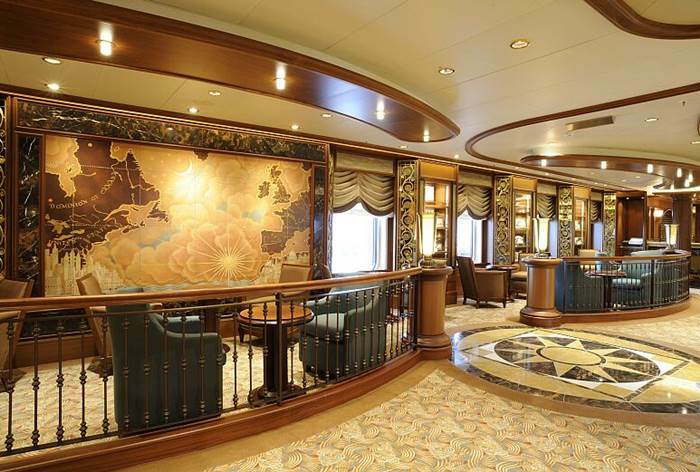 Plenty of QE cruise ship public rooms are decorated in Victoria and Edwardian styles, and have decorative accents and wood-veneer panelling like horseshoe-shaped wrought-iron stairways, etched glass panels and scrolled woodwork. 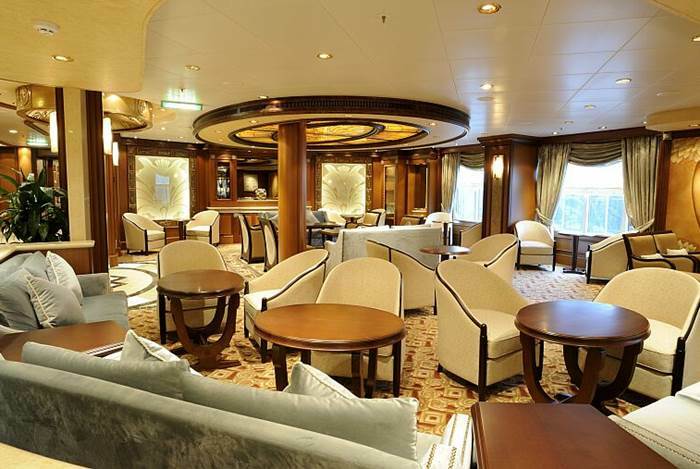 Several public rooms comprise two decks. Queen’s Room features large ballroom dance floor and traditional British tea is served each afternoon in the grand art deco-style room. 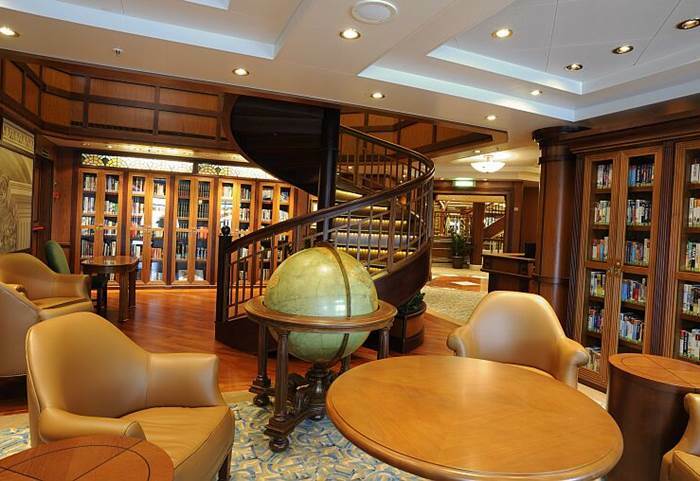 The Library, among the best at sea, is wood-panelled and also two-deck-high, providing 6,000 books with two librarians who work full-time. A separate bookshop offers memorabilia, maritime-related books, maps and stationery. Hemispheres is themed nightclub and high-volume disco, positioned aft of mast, adjacent to Commodore Club. It overlooks the Pavilion Pool. 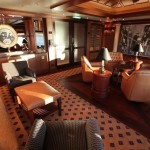 The haven for smokers, Churchill’s Cigar Lounge, is situated on the starboard side. There’s also a casino, fairly large and no smoking. 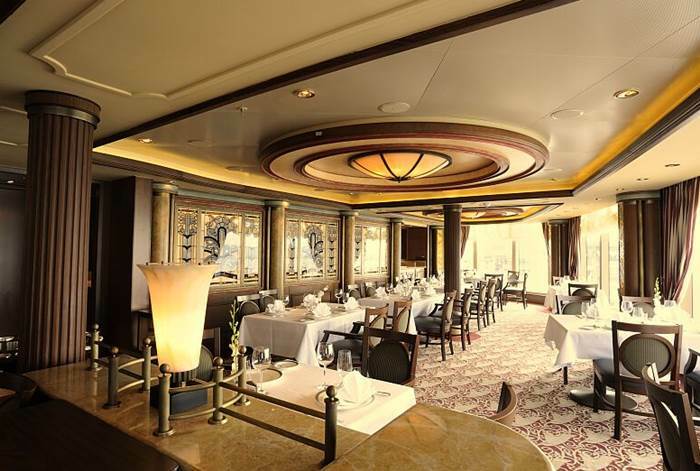 Cunard Queen Elizabeth ship provides three categories passenger accommodations: Princess Grill, Queens Grill and Britannia. 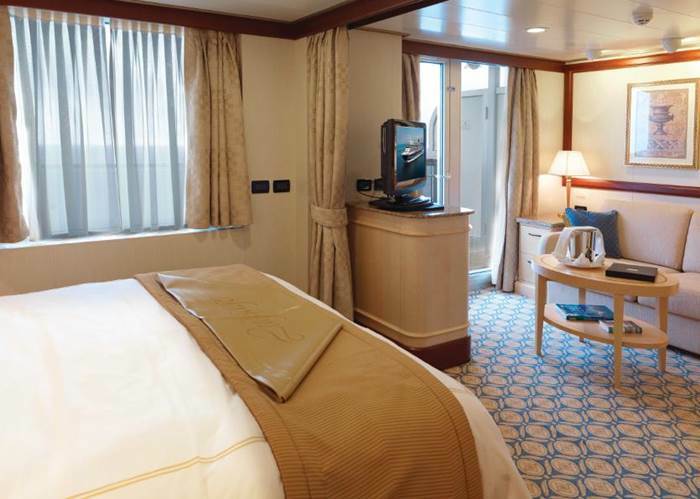 There are just eight accommodation types on board QE, but they include eight Princess Grill, seven Queens Grill, and twenty Britannia grades. 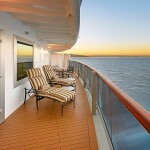 Aft are located four Grand Suites with walk-around balconies for great ocean views. 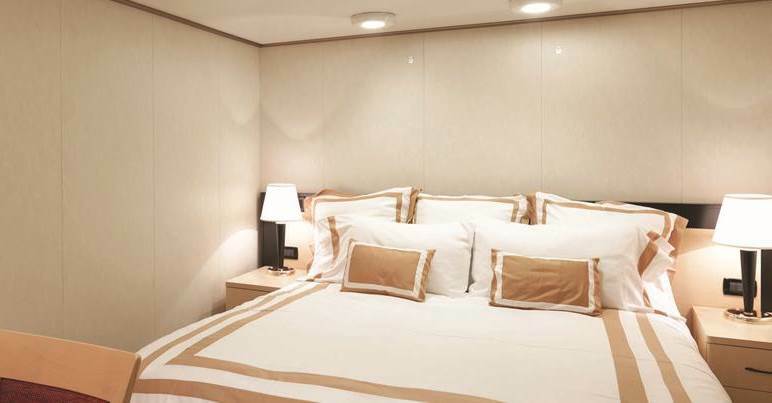 The other choices include Master Suites (2), Penthouse Suites (25), Queens Suites (35), Princess Suites (61), Balcony Cabins (581), Outside-View Cabins (146), and no-view Interior Cabins (143). Retiring to cabin is an appealing option for everyone. 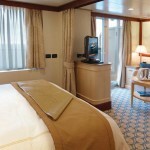 Queen Elizabeth staterooms are decorated stylishly and have at least a bathrobe, slippers, mini-fridge, dataport outlet, British and American electrical outlets, half-bottle of sparkling wine on the first day of voyage. 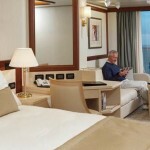 QE guests in grills suites are provided with even more – from pillow menu to shoe shine service and concierge, a separate shower and bath, larger sitting area, full bottle of sparkling wine on embarkation day. 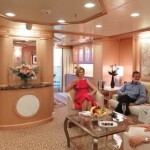 Queens Grill passengers are also pampered with complimentary butler service, fruit basket, daily canapés, and sugar-iced strawberries along with a bottle of champagne on embarkation day. 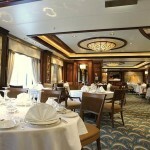 Cunard is best respected for exquisite cuisine, with a variety of well-presented dishes prepared from good ingredients. 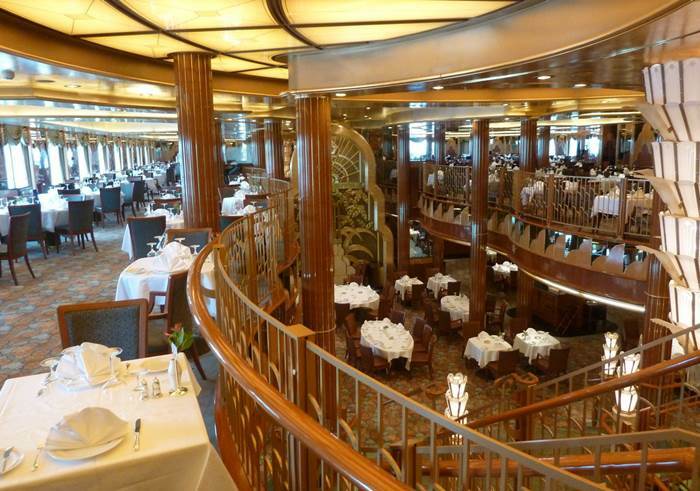 Britannia Restaurant is the stunning two decks high, offering seating on both main and balcony levels. More intimate dining is provided in Queens Grill (142-seat), for guests in suites and top accommodation grades, as well as in Princess Grill (132-seat), for guests in middle-class accommodations. 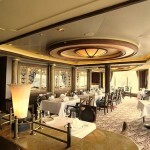 As on Cunard QM2 and QV, each stateroom category on Queen Elizabeth is paired with sea-view restaurant. 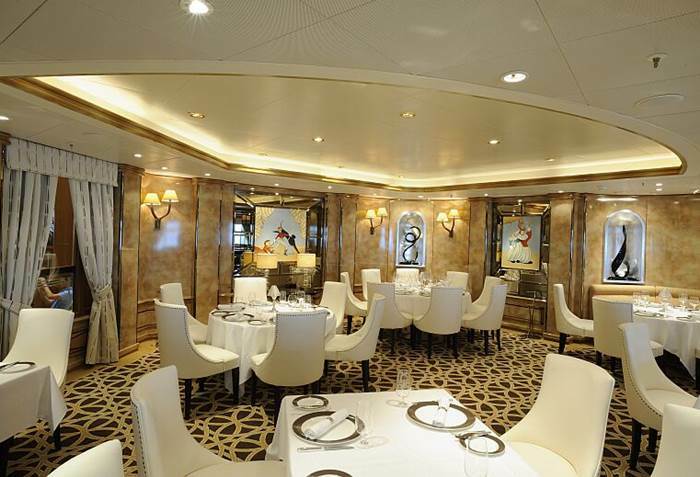 The main dining room, Britannia Restaurant is situated at the stern and evokes memories about the classic ocean liner restaurants as it has sweeping staircase and marbled backlit ceiling. Open seating is offered for breakfast and lunch, and passengers may choose early or late sitting for dinner. 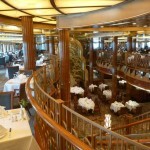 Both Princess and Queens Grill Restaurants are on top of ship, located on Deck 11 and enclosed by curving glass panoramic walls on seaboard sides. Princess and Queens Grill offer single seating, so passengers can enter whenever they choose. Both restaurants are architecturally similar, but are decorated distinctly and create individual feel. 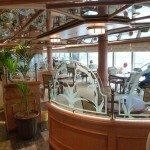 Guests have exclusive use of a private bar and lounge located conveniently next to the Grills. After a dinner at the Britannia Restaurant, the majority of guests move to the Queens Room ballroom. 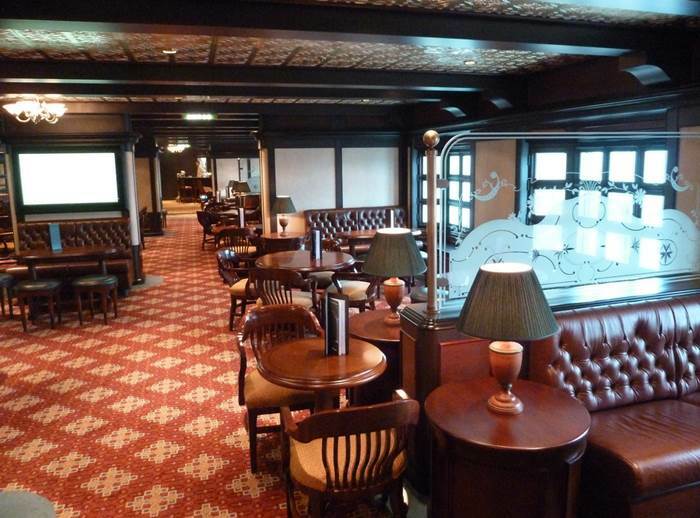 Many other pubs and lounges include the bow-facing atmospheric Commodore Lounge, Midships Bar (paying nostalgic tribute to original QE2), Golden Lion Pub. 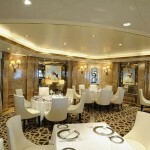 QE, just like QM2, also offers Britannia Club for guests who travel in AA staterooms category. 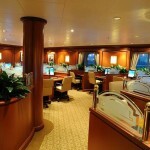 They can choose single-seating dining in the sea-view dining room. 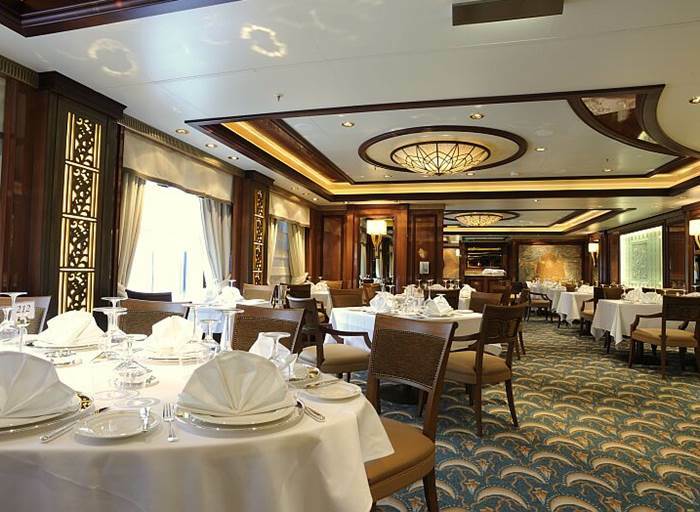 Queen Elizabeth ship has casual Lido buffet, and cozy formal Verandah dining alternative for French cuisine ($35 costs the three-course menu for dinner). 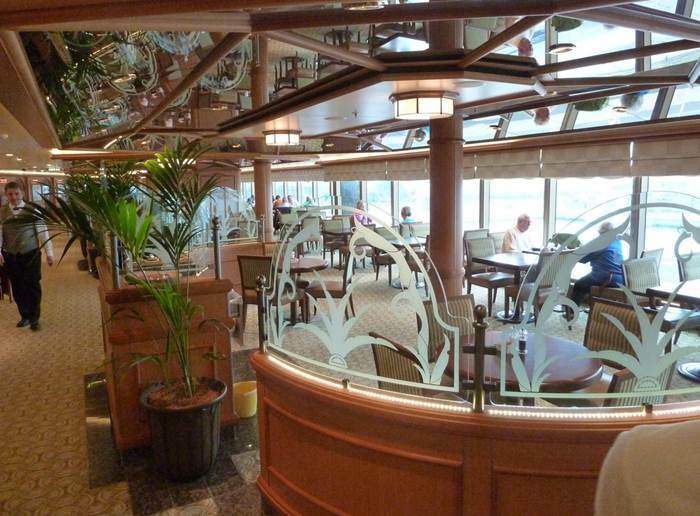 Lido Restaurants are up on Deck 9, featuring sea views and spacious areas, with buffet-style breakfast and lunch. Two of the restaurants offer different regional cuisine in the evenings, in formal setting, while the third continues with the extensive buffet. Todd English is 87-seat restaurant, looking and feeling like an English classic dining salon. It serves Mediterranean cuisine based on chef’s chain of U.S. Olive-brand restaurants. Cover charge of $20 is applied for lunch, and $30 – for dinner. Garden Lounge, named after a room on first QE, hosts occasional “Supper Clubs” evenings with dancing and musical entertainment. 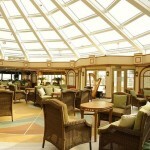 The vaulted glass ceiling gives light and brightness. Golden Lion Pub is another signature of Cunard. It serves English pub food in traditional British pub settings. 7. QE Golden Lion Pub 8. QE Midships Bar 9. QE Cafe Carinthia. QE is equipped to keep her guests entertained every evening. She boasts delicious cocktails, intimate venues and great dancing. 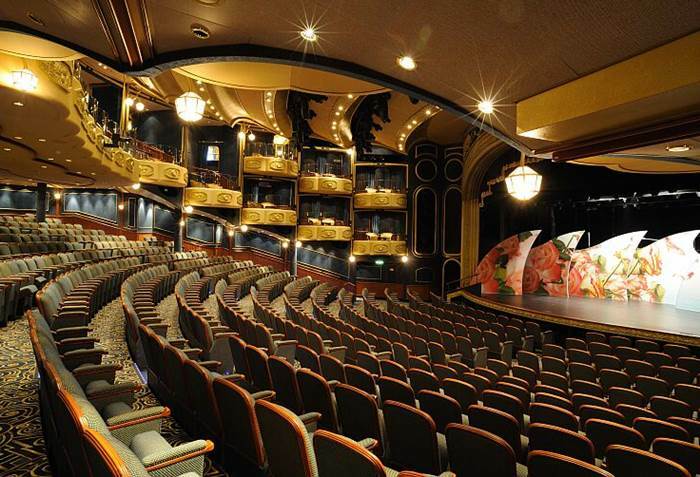 Royal Court Theatre offers live performances and musical productions. 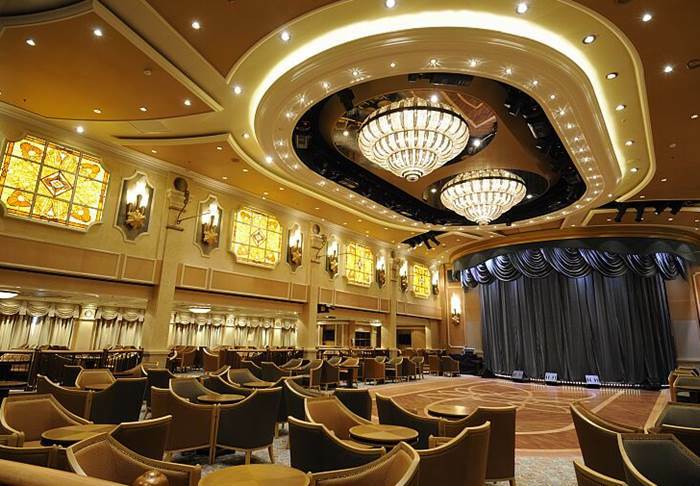 It’s three-deck-high, 830-seat, designed like a classic opera house. 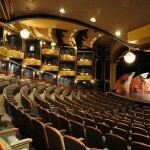 Royal Court Theatre even features twenty private “royal boxes”. The theatre is used for large-screen movies as well. Empire Casino is great to play black jack, roulette, and slots in. Guests often try their luck there. Commodore Club, large oceanview observation lounge, features late-night room suitable for interactive low-volume entertainment. It also offers a wide martinis’ selection. 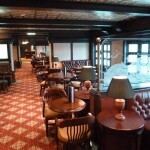 Midships Bar is laidback lounge to relax in and enjoy good company. Queens Room hosts themed balls – Ascot Ball, Black and White Ball. 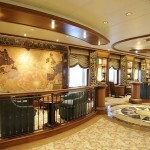 Big Band night is held in Queens Room, live jazz is played in several lounges and bars onboard. 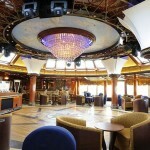 Yacht Club is great QE nightclub with a live band and a DJ for guests to enjoy. The forward-facing spa and gym, plus play areas (indoor and outdoor) for kids, several hot tubs and pools are other amenities for comfort and relax. The beautiful Garden Lounge is near the main pool – it’s conservatory-style spot with a glass roof that is inspired by Kew Gardens in London. Afternoon tea and champagne are served by white-glove waiters. 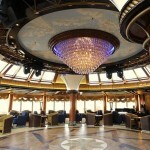 In the evenings it transforms into live music and dancing club. 7. QE Internet Centre 8. QE Royal Spa 9. QE Pavilion Pool. 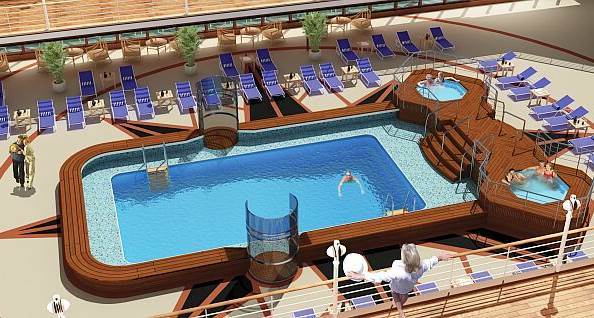 Cunard Royal Spa on Queen Elizabeth is located on Deck 9 and consists of a large gym with great ocean views and high-tech equipment; aerobics area; Thermal Area (extra-cost) with steam and sauna rooms; chamber for mud/steam Hammam-style bathing and relaxation area. Royal Spa is run by Steiner Leisure. It’s extensive and peaceful. The Royal Bath House area includes an indoor thalassotherapy pool and thermal suite; $35 is the price for a day-pass. Various other facilities include three treatment rooms for couples and a beauty salon. The Wellness Centre is available for seminars, geared mainly to selling spa treatments. 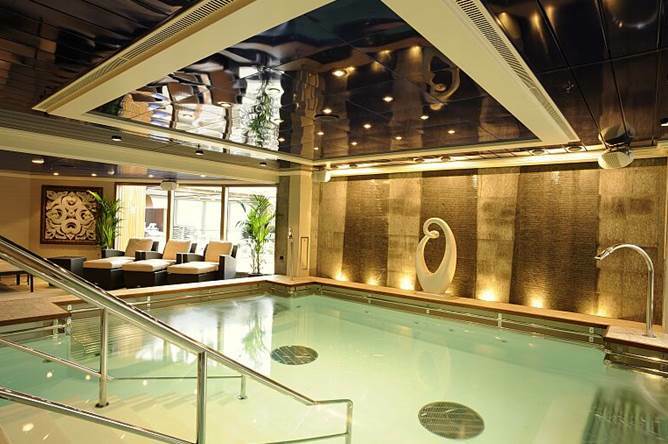 Prices are in line with other cruise ships’ spas: a 50-min. facial for $125; full-body Swedish massage for $119. few shorter treatments are offered, as a 30-min. facial for $80; 30-min. massage for $90; a taster session of mini-treatments for $130. QE gym is state-of-the-art. There’s a vast studio area for various classes, half of which free. 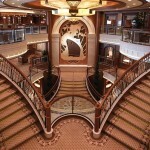 Queen Elizabeth cruise ship also provides some unusual fitness pursuits. Queens Room attracts with fencing lessons at no charge. 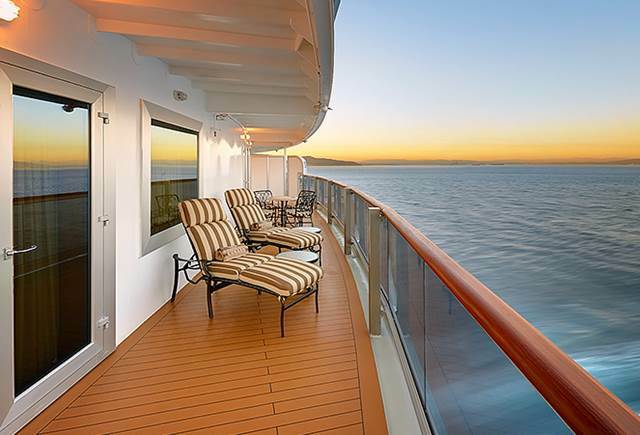 The wraparound promenade deck is excellent for walking and jogging. The Games Deck is on Deck 11, high up and covered, with short bowls, paddle tennis, and croquet. Other outdoor activities include quoits and golf putting. 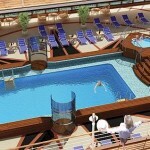 Two pools are available on Deck 9: midship Pavilion Pool, and aft Lido Pool, surrounded by sunbathing area. Each pool features two Jacuzzis and its own bar. Who sails on QE depends on where she is going. A lot of Brits are found on ex-Southampton voyages. 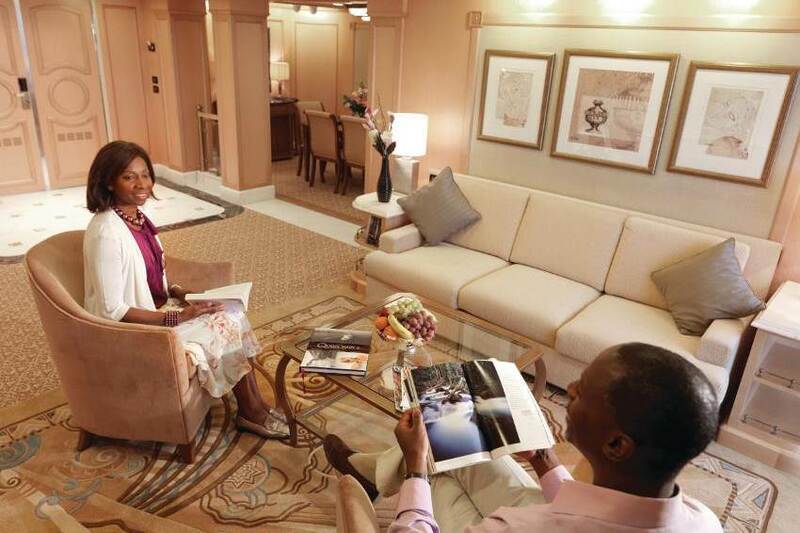 The Cunard mini-cruise deals from Southampton operating every year offer a chance for first-time cruisers to try Cunard Line and attract economically diverse passengers. Cunard annual World Cruises draw guests from all over the world, although there are many well-heeled Brits and Americans. Shorter cruises also attract Brits and Americans, but Cunard ships are also very successful in Germany, Australia and Japan. 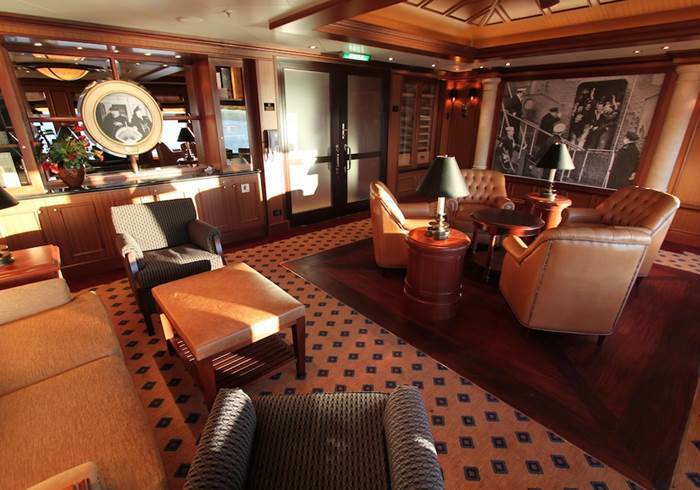 Everyone who sails with the great name of Cunard can feel the inspiration this brand brings. 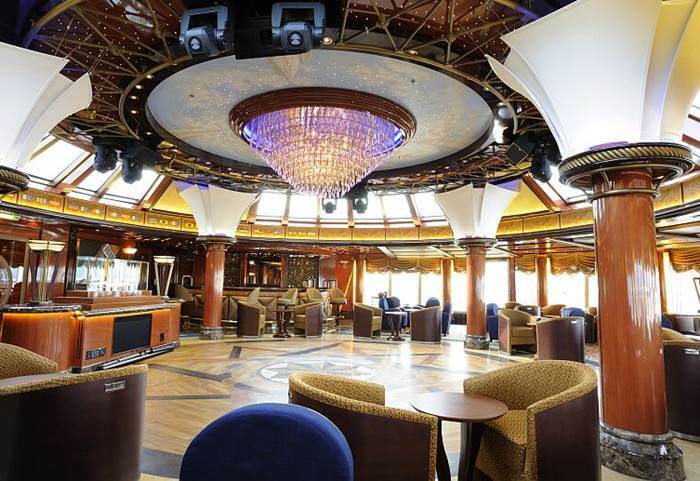 This can lead to a cosmopolitan mix onboard. 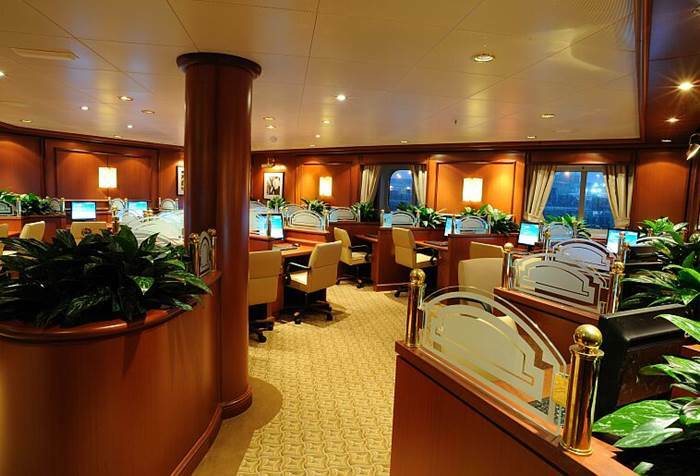 In April 2013, Cunard Line altered its three-tiered dress code including formal, semi-formal, and elegant casual, to simply formal and informal. Line’s representatives said that the change reflected travel trends towards more casual dress codes. 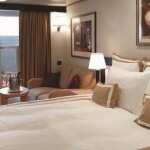 Cunard cruises feature two formal nights each week, or just one on mini-cruises. Dress code is coming into play at 6p.m. Informal nights expect men to wear a jacket; no tie is required. Ladies opt for a skirt, dress or trousers. Shorts and jeans are not allowed. For guests who don’t want to put on best attire, Lido nightly dinner buffet has relaxed dress code, but after 6p.m. shorts are not permitted. Gym wear, swimsuits and sarongs are only allowed in the fitness center and spa, pool-side and on deck. The US dollar is QE onboard currency. 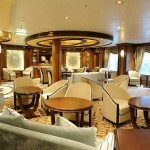 Gratuities are charged automatically to guests’ onboard accounts. Their amount is $13 per day per person for Grill Class accommodation, or $11 per day per person for other accommodation. 15% is added to all wine and bar, health spa and salon bills. There is a blank line on the receipt for extra tip. 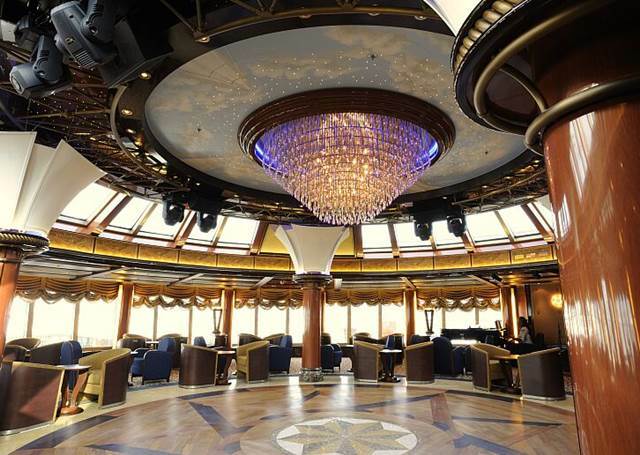 The new Queen Elizabeth cruise ship offers most affordable luxury travel deals. Just like her 2 fleet mates Mary 2 and Victoria, she is a queen and a special Cunard liner signifying a brand name for the best classic British seafaring traditions and exceptional cruising experiences. 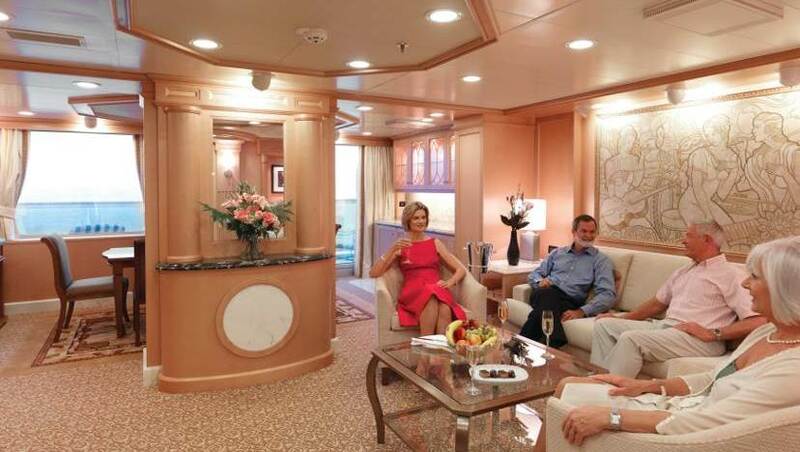 To try the charmingly luxurious Cunard cruise ship Queen Elizabeth is simply a must – just to feel that special new-age “queen and king” experience guaranteed 100% with the very best of this modern classic, and so special line – on each vacation, every time, all the time! 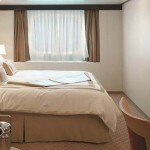 Enjoy your Cunard Queen Elizabeth cruises, and best of luck with the deals!